Melbourne has emerged as the most important hotspot for apartment completions in 2016. According to News Ltd reports, the Melbourne CBD stands as the nation’s critical hotspot for likely apartment completions over the next two years, as the city is expected to sign off on some 1,846 units of newly completed stock in 2016, followed by a whopping 4,432 in 2017. Melbourne is set to come out ahead of by Newstead (Qld), Mascot (NSW), South Brisbane and Doncaster (Vic) in 2016, and then Docklands (Vic), Sydney CBD, Brisbane CBD and Parramatta in 2017. 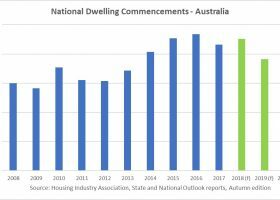 Having undergone considerable levels of growth in multi-residential construction over the past five years, the boom in apartment building throughout Melbourne and its surrounds shows little sign of abating over the near term. The city has a whopping 123,622 apartments proposed across 734 projects, while Sydney, Brisbane, Perth and Adelaide have 88,013, 34,353, 14,643 and 6,450 planned respectively. The figures suggest that the existing pipeline of work across Australia remains strong for now notwithstanding expectations of a slowdown in construction over the medium to longer term. Indeed, the 31,556 apartments expected to be signed off across the top 20 markets throughout 2017 (implied by the figures) will be more than double the 14,980 anticipated completions this year. While the figures for Melbourne come as welcome news for builders in the short term, however, there are fears the volume of new stock coming on to the market will exacerbate what forecasters such as BIS Shrapnel suggest is a looming situation of oversupply within that market. Already, at least one in 10 apartments which change hands throughout the city is being sold at a loss, according to a recent CoreLogic report. CommBank head of property strategy and Research Kevin Stanley said Melbourne was leading the biggest apartment development boom in the nation’s history, but acknowledged that the volume of stock coming into markets such as Melbourne and Brisbane could lead to higher vacancy rates in those markets. “I think Australian cities have not really seen a building boom like this before, in size and in type,” Stanley is quoted as saying by News Ltd. “What will probably happen is that when the buildings are completed and those who invested in the apartments put them on the market you will find that people move into these areas from other places and from older buildings into the new buildings. Stanley said suburbs which top the list for apartment construction typically offer good accessibility to transport, amenity and employment links. He said a key positive in the report was an upturn in Adelaide, which was tapping into demand for inner urban living and creating a new market of high-rise and high density development within the inner city. Bodes poorly for congestion and the strain on infrastructure for Melbourne in future – the Victorian government has done far to little to ensure that the city's transit needs are met.